CHARLOTTE, NC- Hospitality House of Charlotte announces its sixth annual fall luncheon, Superheroes Among Us, to be held on September 14th at the Sheraton Charlotte Hotel and Le Méridien Charlotte. 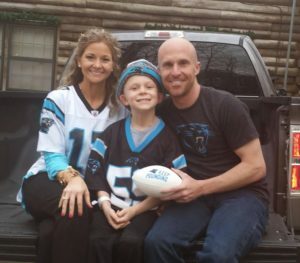 Seven-year-old cancer patient and honorary 2015 Panthers Coach Braylon Beam, alongside his family, will serve as the keynote speaker at the event, shedding light on some of the battles that families at Hospitality House of Charlotte face on a daily basis. Beth Troutman, co-anchor of WCNC’s evening newscasts, will emcee. Longtime supporters of Hospitality House of Charlotte, The Michael A. Kahn Family Foundation along with the Charlotte Checkers Charitable Foundation, have generously instated a $15,000 Challenge Match again this year, doubling the impact of gifts made to Hospitality House of Charlotte at the luncheon. The event is open to the general public and individual tickets are $50. Individual admission and table sponsorships can be purchased by contacting Christine Green at cgreen@hhocharlotte.org. Advance reservation is required; the deadline to reserve tickets is Thursday, September 8th.